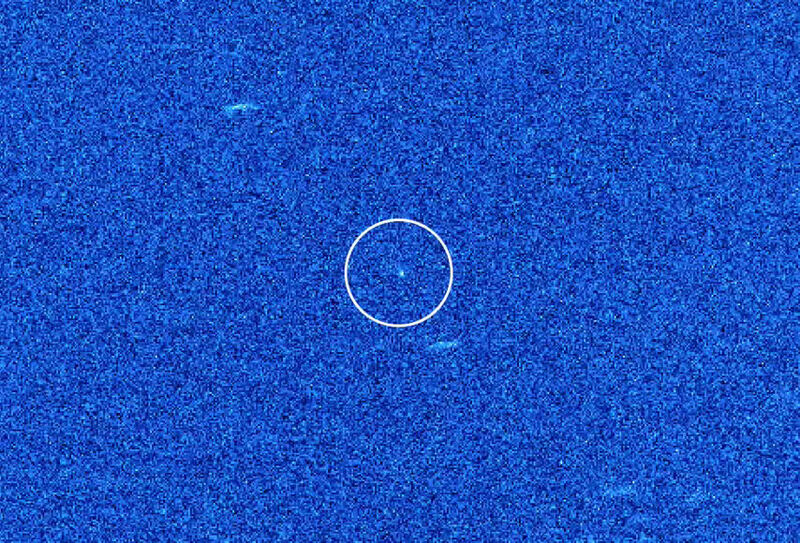 The interstellar object 'Oumuamua (circled) as seen by the 4.2m William Herschel Telescope on La Palma. Background stars and galaxies appear as streaks due to the telescope following 'Oumuamua as it moved across the sky. Credit: A. Fitzsimmons, QUB/Isaac Newton Group, La Palma. 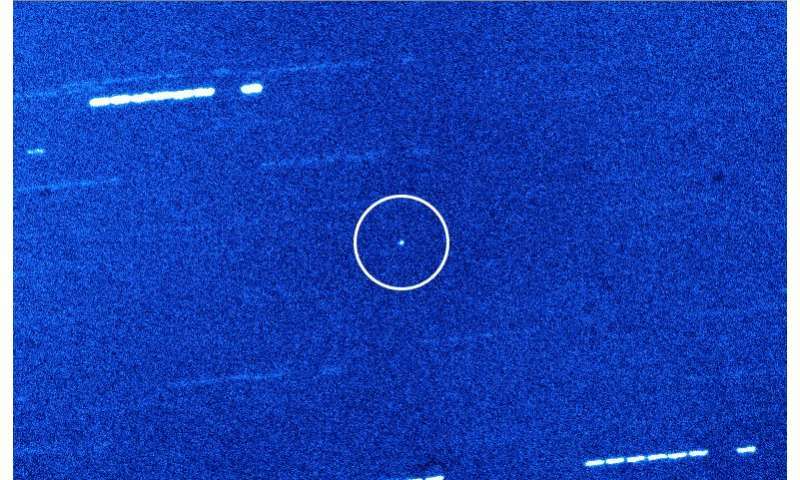 Short loop of 'Oumuamua moving against the background stars. Credit: A. Fitzsimmons, QUB/Isaac Newton Group, La Palma. Hmmm, GoO, wonder if it was an et version of the U2 spyplane, doing a quick and silent reconnaissance with radio silence blackout and carefully camouflaged craft. Or perhaps a failed manned trip from a distant star, and the crew died off a couple thousand years ago leaving their ship carreening about the Galaxy on an unguided voyage. Actually, with the Universe as large as it is these ideas are not 'impossible', they just belong in the low chance column, just like BH Mergers and Neutron star mergers, not 'common', but they happen regularly. There is no way to know if it was "natural" or not. They could have merely not wanted to answer us or possibly they use a form of communications we have never thought of. It is only our hubris that makes us believe they would either want to communicate with us or had compatible technology to do so. "They", "Them", "Those LGMs" are carefully spying on you! And you thought you could hide in your mommy's basement. However, after reading these comments? "They" decided to go look for another star system. Continuing "Their' futile search for intelligent life. When you stop to think about the cost in diverted funding, scarce resources and limited number of competent personnel? Obviously, These LGMs would "Themselves" need grade-creep to qualify as intelligent. Obviously the ship is long dead, alone with the passengers, having likely gotten stuck in the interstellar void. To insist that such a cigar shaped object is naturally formed, is insulting to those who can think. To those who can't think, the explanation offers a nice pacifier. Be happy. You are alone in the universe. You are number one! Proof!!!! The earth is FLAT! The only problem with this idea is that this object is not gliding smoothly through our solar system, but is tumbling head over heels, about once every eight hours. So if it is an alien spacecraft, it's in trouble. Obviously it was a seed ship, a carrier dropping off nanobots which are at this moment replicating like rabbits in the outback and intent on dismantling our sun. We should send a probe after it ASAP and spank it. Just because an alien race makes it to our solar system doesn't mean that they are super smart. The particle density of intergalactic space is about 1 hydrogen atom per cubic centimeter, and between stellar clusters in a galaxy the particle density is greater, and between stars greater still, and between planets around a star even greater. What I'm saying is that in an interstellar journey at high rates of speed between stars, an object is going to accrete a lot of mass over that vast distance in the form of those particles, particles that are statically charged and will stick to a spaceship's hull like crazy glue. They will arrive at their destination looking like an asteroid. You're pretending to be a physicist. It's tacky. Not necessarily. Nanobots may need artificial gravity for some reason. And rotation could aid dispersal out the ends. A skinny spacecraft would be one of the worst possible designs to accomplish this as the percent of internal volume where the artificial gravity would be strong (the two ends) would be small. If artificial gravity was a concern, any of a variety of wheels, flattened disks, etc., would be superior. Occam's razor exists for precisely this reason. 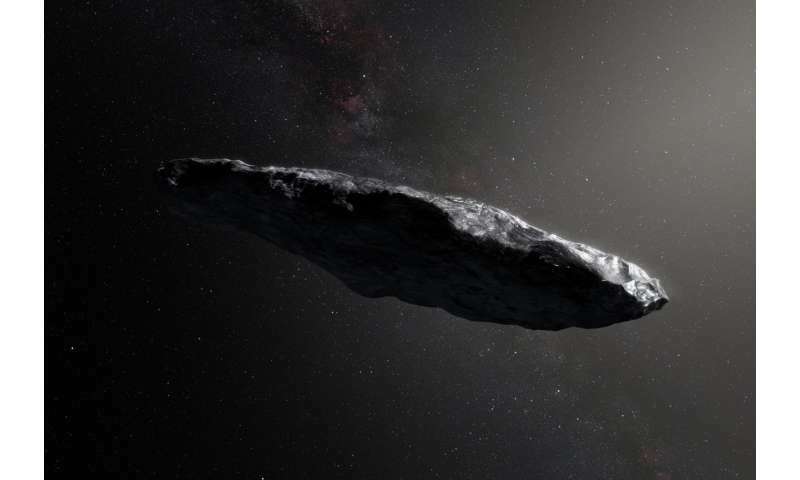 Its size and shape suggest that it could be a #2 General Products hull which has been adrift for a loooong time and gained an accretion of interstellar material. Not necessarily. If these needed to be launched through an atmosphere, or expected to pass through gas clouds at some point in their journey, then a small aspect ratio would be a benefit. They could be spun up after passage. -and if a civilization were launching millions of these, the spinning cylinder would be the cheapest and most efficient. No moving parts. Nanobots or bioseeds would need very little room as they are self-replicating, and so could be located at optimum g force locations along the spinning cylinder. And as I said, no ancillary dispersal mechanism needed. And there is a face on Mars..... and a Man in the Moon. We see ourselves everywhere we look. Until you post a pic proving that's an alien ship (your collection of rectal probes don't count), I'm going to assume it's just a long rock. More proof that the EARTH IS FLAT!!! Oh damn, someone else already posted that joke.